Advantages: The only reference for Luftwaffe Phantoms that you will ever need - very comprehensive coverage; excellent colour photography of aircraft in service and in detail; perfect tie-in with AirDOC Decals; abundant colour profiles; colour four-view plan illustrations of all major camouflage types; separate 1/48 scale plans in a pocket at the rear of book; captions in German and English with an English text summary at the back of the book. Disadvantages: Some profiles reproduce slightly dark; some minor editing glitches with English text. AirDOC is a new German company that has already released several decal sheets for Luftwaffe Phantom fighter and reconnaissance variants. The decal sheets for F4 Fs in Norm 90J Grey, and for RF4 Es in Norm 83A/B Lizard camouflage are both reviewed here on HyperScale. Their latest production also focuses on German F-4s. "Luftwaffen Phantoms" by Andreas Klein is a magnificent book that comprehensively covers Luftwaffe F-4Fs and RF4 Es from their service entry to the present day. The hardback book is attractively presented with an evocative painting by Ronald Wong on the dust jacket. 200 full-colour glossy pages are encased between the covers. The 21cm x 30cm portrait format ensure plenty of space for large attractive pictures. The body text is in German but captions are supplied in both English and German. An English-language summary is also included as an Appendix. For me, the highlight of this book is the abundant colour photos and profiles. Most of the 200 pages display between one and four captioned photos or illustrations. The photos are excellent. The vast majority are in colour (the only exceptions being a few b&w photos from the reconnaissance camera of an RF4 E and from the McDonnell-Douglas factory), and they cover Luftwaffe Phantoms in operation and detail. All the major schemes are well depicted in these reference photos, including temporary air combat and exercise markings. Seventeen pages are devoted to describing the various camouflage schemes applied to Luftwaffe Phantoms. This is very effectively achieved using a combination of colour four-view illustrations, associated tables with RAL colours quoted, text and photos of relevant case-studies. Special schemes are also singled out for treatment. This 20-page chapter shows photos of 19 wild colour schemes. Each scheme receives a full-page, with two photos on each page - one photo taken from each side of the aircraft. This is an extremely useful approach for modellers. Modellers will also appreciate the large number of detail photos of Luftwaffe Phantom airframes, powerplants, cockpits and ordnance. A final pleasant surprise was the inclusion of four sets of technical drawings. Each is loose leaf, folded into a pocket on the inside back cover of the book. Two sets of profile drawings are supplied for each major variant. These drawings clearly depict the differences between early and late Luftwaffe Phantoms. Luftwaffe Phantoms have been a colourful feature of European skies for 30 years, yet references on the type have been fairly scarce. "Luftwaffen Phantoms" addresses this shortage in spectacular fashion. Andreas Beck's "Luftwaffen Phantoms" is truly a first-rate, one-stop reference book. Even if you can't read German, the logical structure, relevant photos, English-language captions and abundant artwork more than compensate for the lack of English body text. The book is very timely for modellers with the recent re-release of the Hasegawa 1/48 scale F-4F Phantom; and Revell's new RF4 E and F-4F in 1/72 scale. The availability of AirDOC's 1/48 scale decals for both the Luftwaffe variants is another welcome factor. However, any aviation enthusiast will appreciate the variety and depth of coverage delivered by the author. Highly Recommended to all fans of Phantoms and modern Luftwaffe aircraft.. Thanks to Andreas Klein from AirDOC for the review sample. 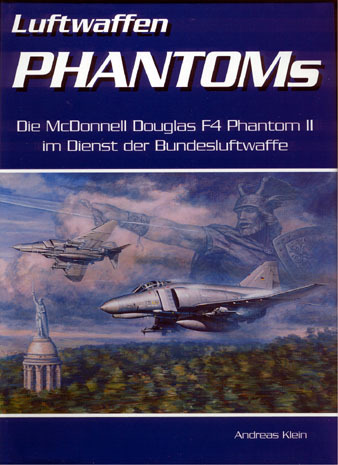 "Luftwaffen Phantoms" is available for EURO 49.50 by Mastercard and VISA card. Book will be forwarded by surface mail for EURO 10.00 . Orders should be sent by fax.